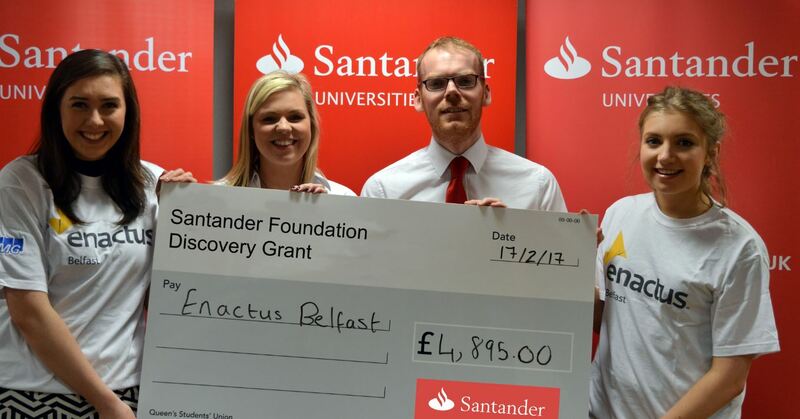 The Queen’s University student society – Enactus Belfast – has received £4,895 from the Santander Foundation to fund and further the work of the KickStart project. KickStart works with young ex-offenders in the Belfast area who have children. The project aims to help the beneficiaries acquire qualifications to make them more employable, enabling them to turn away from crime and offer a better example for their children. Commenting on the gift Emma Jones, Vice-President at Enactus Belfast, said: “We are delighted at the news that Enactus has received the grant from the Santander Foundation. It will give the Society the capacity to scale-up our projects to make a greater impact in the local community”. Enactus Belfast is a student-led social enterprise society which utilises the positive power of entrepreneurship to empower the individuals its members work with throughout Northern Ireland. It brings together a diverse network of university students, academics, professionals and industry leaders who share the vision of creating a better, more sustainable world transforming the lives of others through the positive power of business. The Society runs a range of social and commercial projects in communities in Belfast and further afield, making a real difference to the lives of those they work with. The grant will enable Enactus to facilitate a number of workshops which will allow attendees to gain various Open College Network (OCN) qualifications. The aim of the project is to make the beneficiaries more employable having exited prison, so that they can build a better future for themselves and their children. The Santander Foundation provides grants to small charities and social enterprises working with disadvantaged people to fund skills, knowledge and innovation projects across the UK. Discovery Grants of up to £5,000 are available to support three types of activity: Explorer: improving people’s knowledge; Transformer: supporting skills and experience; Changemaker: innovative solutions to social challenges. Over the last five years, the Santander Foundation has provided over £25m to 12,600 UK charities through Discovery Grants and Staff Matched Donations. Media inquiries to Sarah Webster at Santander, tel: 020 7756 5533.